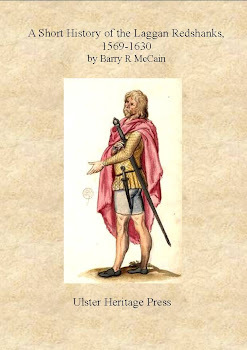 Members of the MacFarlane Highland Scottish clan settled in Ulster in the sixteenth century, as did many other families from the Scottish Gaeltacht. The MacFarlane, or more properly, Mac Pharláinn, families were native to the lands west of Loch Lomond. Many of the Mac Pharláinn families that settled in Ulster were in the Redshank colony in the old Portlough precinct in east Donegal. The Redshanks in the Portlough precinct were part of an elaborate plan initiated by the fifth Earl of Argyll, Giolla Easpuig Donn Caimbeul. His niece was the famous Iníon Dubh, mother of Aodh Rua Ó Dónaill, and it was on her lands that many Caimbeul sponsored Highland Gaels settled. In the sixteenth century Clann Chaimbeul spread from their homelands in mid Argyll extending their bases and influence in both the Highlands and Lowlands of Scotland. Clann Chaimbeul was the most successful kinship group in early modern Scotland. Their great advantage was they were Gaels, but could operate not only in their traditional Gaelic society, but also in the emerging British world, including the Scottish Lowlands. The earls' (of Argyll, head of Clann Chaimbeul) main base was Inveraray on Loch Fyne, and there they had access to the Firth of Clyde and the western seas including the North Channel passage to Ireland. The Mac Pharláinns of Arrochar were drawn into Lord Argyll's elaborate network of allies and they were one of the many Redshank families that settled in east Donegal. For more information of Mac Pharláinn families in Ulster follow the link below. Please patronize the advertisements on the Redshank blog as they keep the blog up and running and allow news and information to be posted. By clicking on and using our advertisements you help the Redshank blog. Many thanks agus go raibh maith agaibh. The Redshank will feature articles on the history and legacy of Argyll and Islands Scots circa 1200 to the present. The blog will feature DNA results that are leading to a better understanding of clan and family kinship groups in Argyll and the Islands. The Redshank blog will also focus on Gaels from Argyll and the southern Hebrides that migrated to Ireland circa 1450 to the early 1600s. They are part of the Ulster Scot community, yet differ in some regards. They were Gaelic speaking and have both Presbyterian and Catholic backgrounds. The main areas of settlement were north Antrim and east Donegal. They remain there today and their descendants also participated in the Ulster Migration to Colonial America and Canada in the 1700s and 1800s. They became part of the Scots-Irish community in the New World. The Redshank settlements in Ulster have not been studied in depth in the past. Their history is often overshadowed by the large influx of Scots that migrated to Ulster during the Plantation. This blog will make their interesting history better known and show how they fit into the Ulster Scot story.